Wow, I’m busier at this conference than I thought I’d be. I didn’t realize my evenings would be so booked! 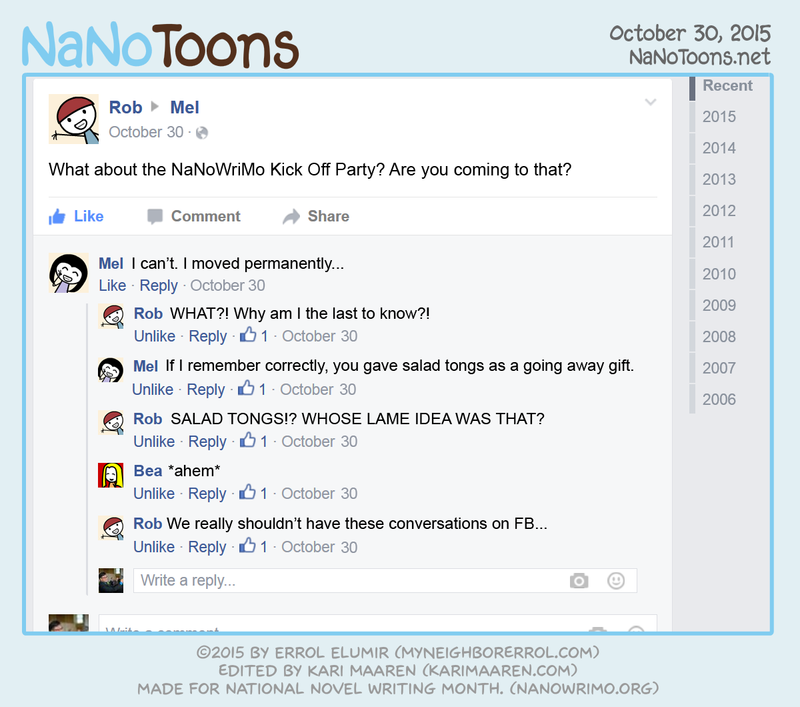 I just have to squeak out more NaNoToons! Allo all! 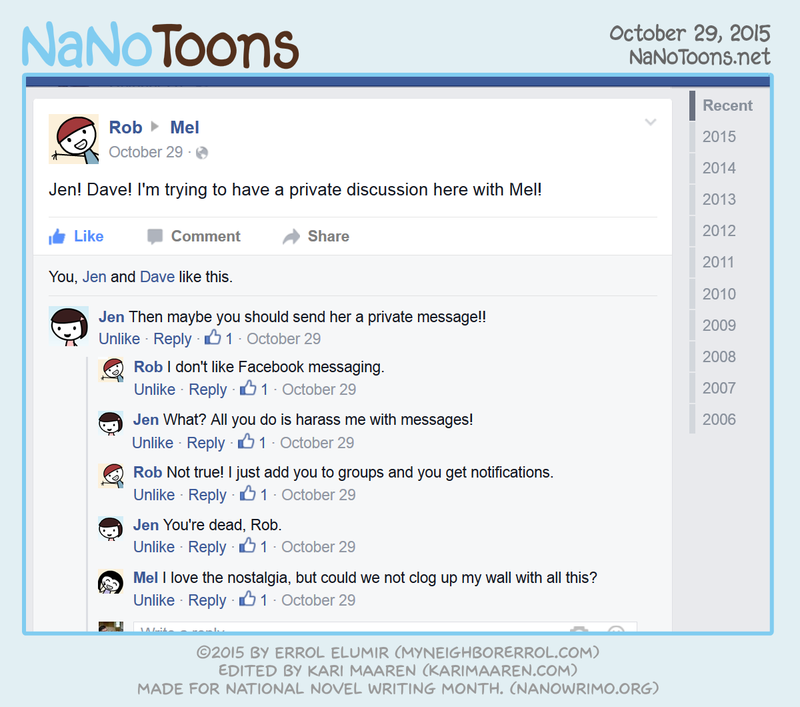 I’m currently in San Jose right now, but if you check the facebook page, you’ll see I was working on NaNoToons on the plane! Huzzah! And…interesting things happened to me at the airport. 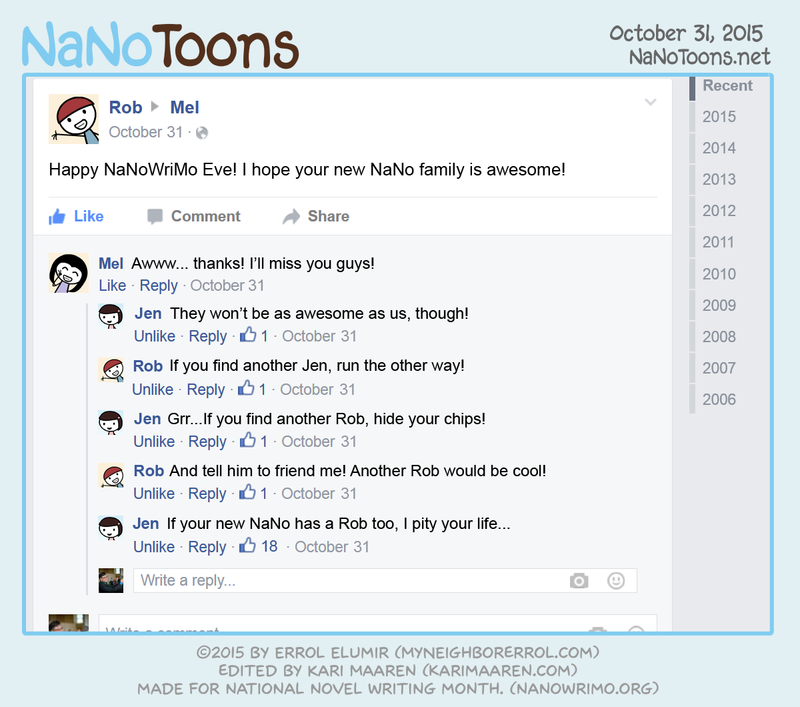 ^_^ I hope to put it in the comic on My Neighbor Errol! Oh, if anyone is wondering, yes there will be an actual comic. I just thought this would be easier considering I don’t have a buffer up. I was wrong, of course. These took me a lot longer than I expected. Ok, I checked this, and this time I’m pretty darn sure all the names are correct! I’m so sorry about that! And yesterday, I was at an Escape Room Unconference, so although I saw people tweet me it was wrong, there was nothing I could do about it! Bummer! Oh, and I wasn’t too sure if this thing updated FB. It does. Phew. Less updating for me! EDIT: Blargh!! I made a mistake already! It is supposed to say MEL not Jen. Sorry! Hello! 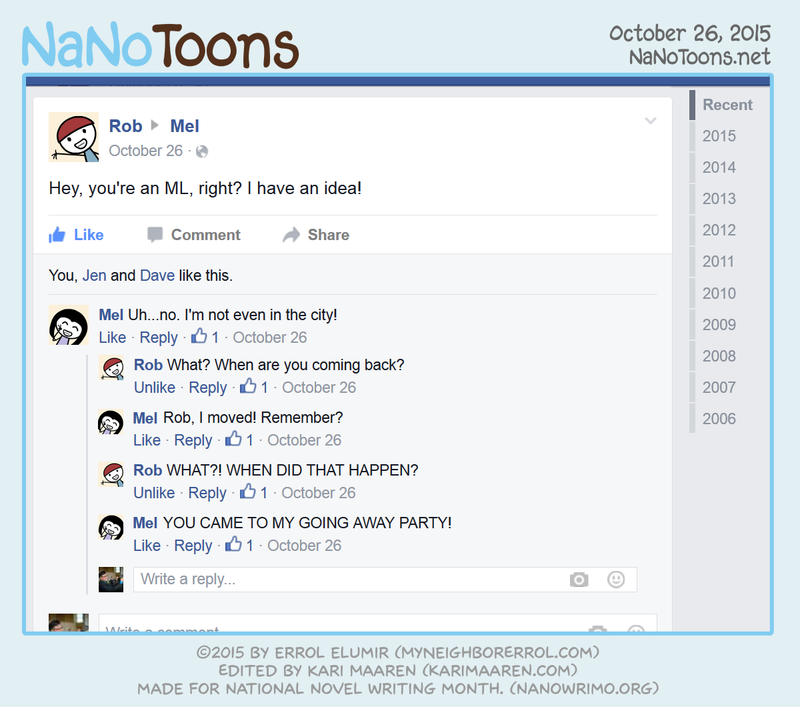 It’s getting closed to NaNoWriMo! Huzzah! Are you guys ready? Good grief, I am not, but I’ve been grumbling about that for a while. 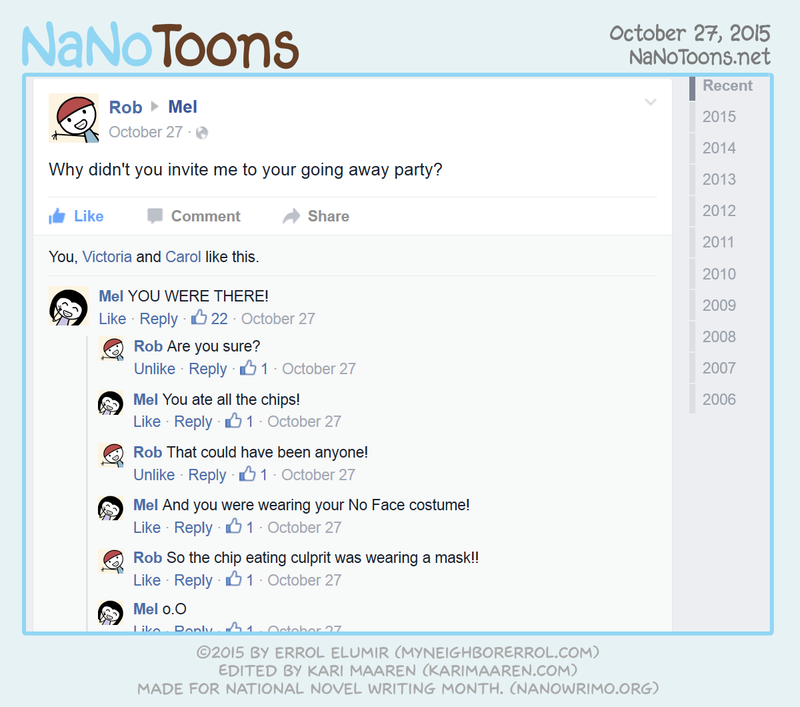 First off, I did a #NaNoSelfieSprint Video, a challenge to raise awareness for NaNoWriMo! By all means, if you like doing videos and want to participate in something a bit nerve-wracking and fun, give it a try! I realized I haven’t updated a video to my account since 2012. Wow, I’m surprised they didn’t shut it down. Oh yes, Kari Maaren is editing the comics again this year. At least, I hope she’s editing them. I did ask her and she said yes, don’t get me wrong, but I’ve been late getting them to her so here’s hoping they get done in time for her to edit. 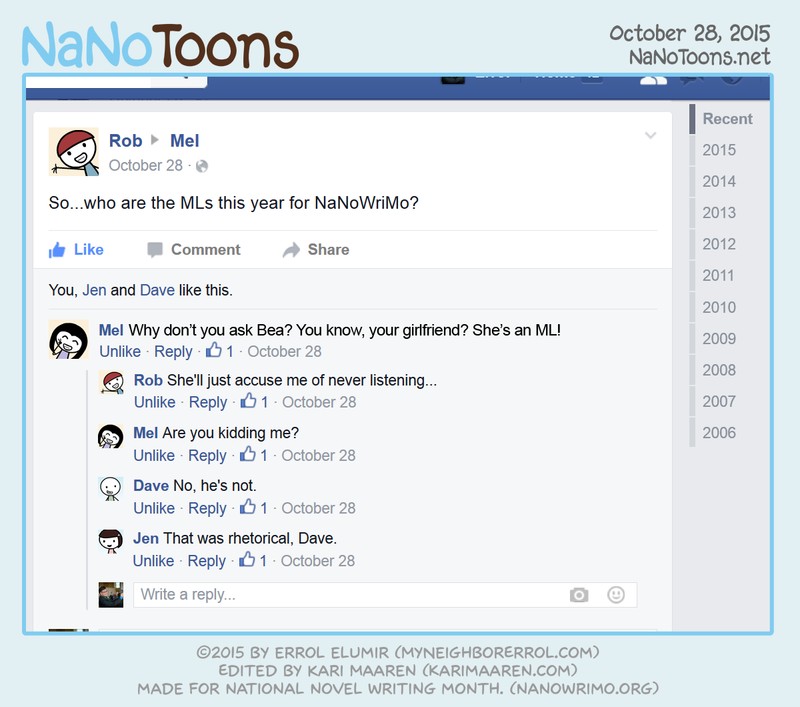 One last thing, this year is my 10th NaNoWriMo! ^_^ HUZZAH FOR TEN YEARS! I should celebrate somehow.